Thursday, April 26, 10 a.m.-2 p.m. 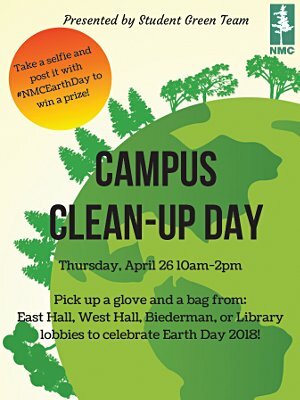 Pick up a glove and a bag from the East Hall, West Hall, Biederman or Library lobbies to celebrate Earth Day 2018! Take a selfie and post it with #NMCEarthDay to win a prize! NMC’s catering services by Sodexo will be temporarily paused starting May 19th as construction begins on the new West Hall Innovation Center. We look forward to serving your catering needs again in August when we reopen in our temporary location in the Oleson Center. We enjoy working with you, appreciate your patience during this transition and look forward to serving you fresh, high quality food again beginning fall semester. To schedule fall catering, please email catering@nmc.edu and we will contact you regarding your request. If you have any questions please contact (231) 995-1403. TRAVERSE CITY — The Third Annual IT Academy Olympics will be held on Friday, May 4, 2018 at the Northwestern Michigan College (NMC) James J. Beckett Building in Traverse City, Michigan. Sponsored by a variety of local businesses, the competition is designed to give teams of area career and technical education (CTE) students an opportunity to apply their information technology (IT) skills. First offered in 2016 to infrastructure students at the Traverse Bay Area Intermediate School District (TBAISD) Career-Tech Center (CTC), the competition was expanded in 2017 to include developer students. More than 80 students participated in the 2017 competition, which featured a new website design competition and a robot design course. CTE students from the Charlevoix-Emmet and Wexford-Missaukee school districts have been invited to participate in this year’s competition. Gift cards will be awarded to 1st through 5th place teams. Upcoming Wellness Walks with Chris Barr! Just 15 minutes of your break time! The Office of Retirement Services is holding a Traverse City seminar on April 26 at West Middle School. Register here through the office of Retirement Services.